Greek cooking was a forerunner to much of Western cuisine and spread into Roman and Egyptian food culture very quickly. It was a Greek who wrote the first cookbook as early as in 320 BC. The Japanese developed their own cuisine in a very different fashion but share the same frugal characteristics of Greek cuisine by using fresh, local ingredients and a light hand to enhance their flavours and tastes. 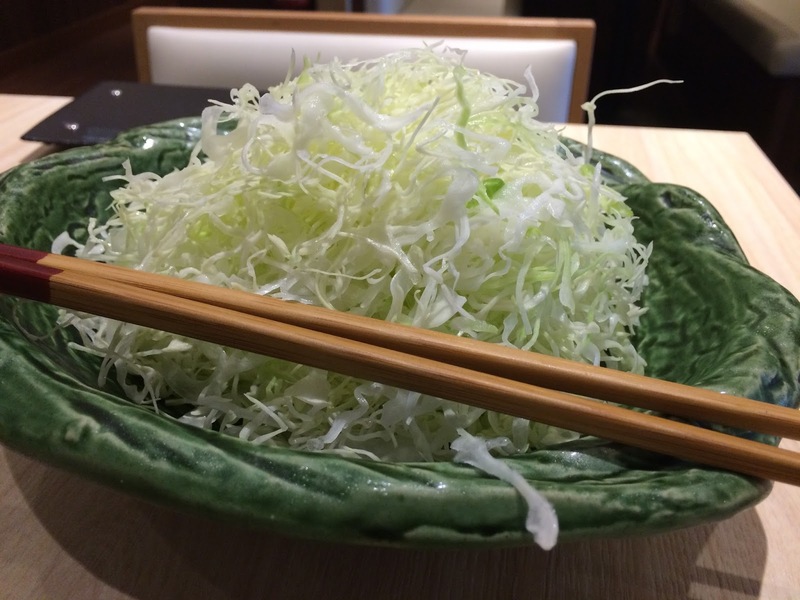 Even today, Japanese food continues to influence food habits around the world. I attribute the recent trend of eating raw meat in the West to Japan's export of sushi. 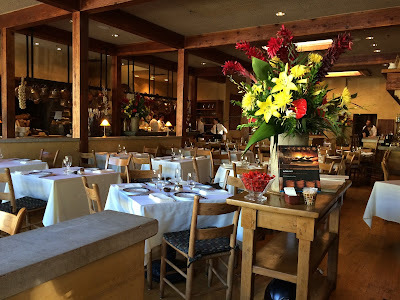 Greece has been exasperating much of the Western world with their financial mismanagement lately, but feel indebted to them whenever I walk into Evvia at Palo Alto. I have sung their praises before, but Evvia deserves an encore. I decided to stick to my favourite dishes here and began with the starter of Octapodaki tou Yiorgou, octopus grilled in the traditional style with lemon, oregano & olive oil. 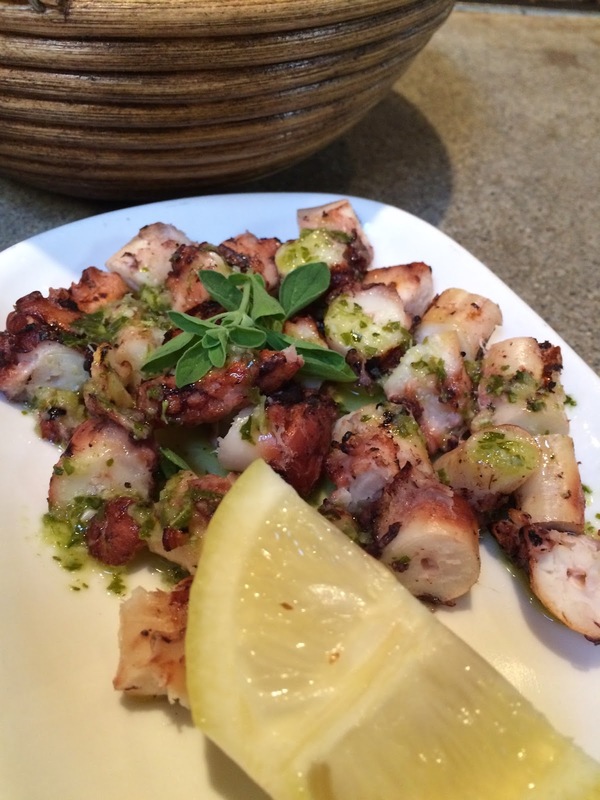 Octopus has never tasted this good! For my mains, it had to be their lamb chops again. 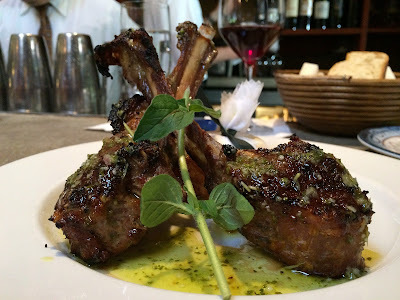 The Arnisia Paidakia is rib-cut and mesquite-grilled lamb chops with olive oil lemon roasted potatoes that they will serve as a portion of four (or a reduced portion on request - they are really nice about such things). Like I have said earlier, this is probably the best rendition I have tasted of my favourite dish. 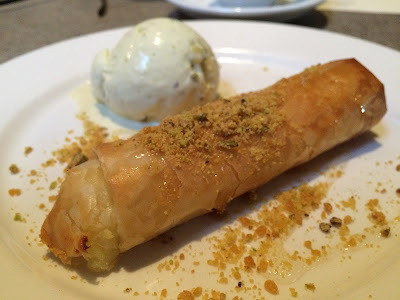 I ended with the Galaktoboureko, traditional phyllo wrapped vanilla bean semolina custard with pistachio ice cream. Multi-layered phyllo has been a long tradition in Mediterranean countries with both the Turkish and the Greek boasting the prowess of their women and chefs who mastered these skills and passed them down since hundreds of years. This dessert at Evvia reminds you why. 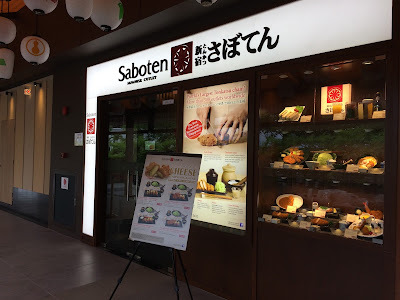 On my way back from the United States, I briefly stopped by at Singapore where I had a chance to eat at the newly opened Saboten Tonkatsu restaurant within Millennia Walk. While I have been enjoying Japanese cuisine for some time now, I was introduced to the Tonkatsu only during my recent vacation to Tokyo and Kyoto. 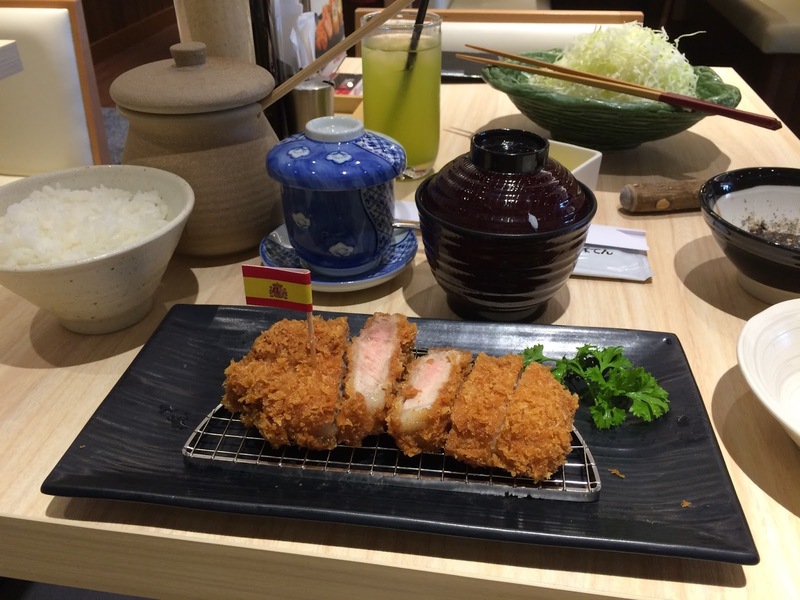 This deep-fried Japanese cutlet has made an impression on me and I wasn’t going to pass up an opportunity to tuck in one more time! Saboten makes the entire Tonkatsu experience stand out by importing authentic Japanese ingredients and offering prime pork options. 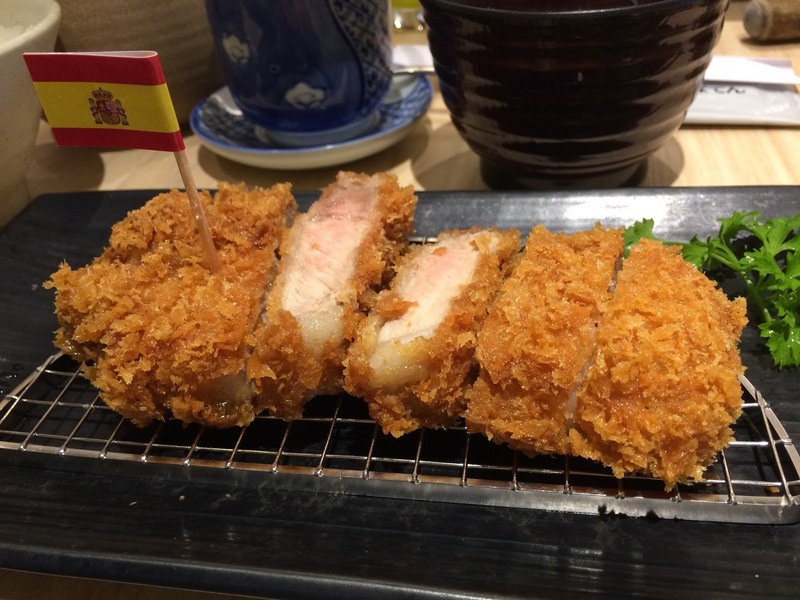 I chose the Iberico Loin Katsu Gozen, Iberian ham sourced from acorn-fed black Iberian pigs in Spain. The pork cutlet comes with aromatic Japanese Uonuma Koshihikari rice, a heap of chilled juliennes of cabbage that is crunchy and juicy, a house-made Tonkatsu sauce on roasted sesame seeds and a goma dressing for the cabbage. 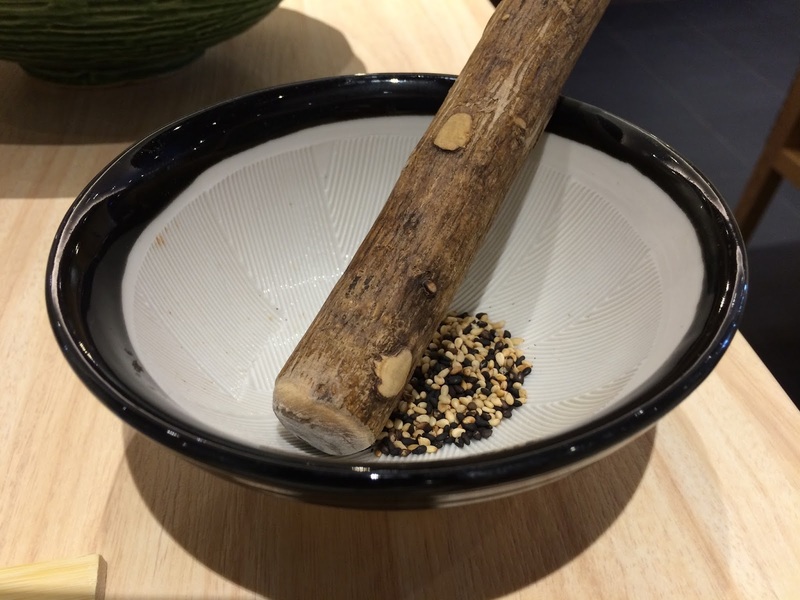 My server made sure I knew that I had to hand-grind the freshly roasted sesame with the pestle and mix it with the sauce to get started. The Tonkatsu was served hot and even came with a Spanish flag on it to certify its Spanish heritage. The crisp exterior hid an inside of perfectly tender and marbled Iberian goodness that strummed my taste buds the moment it hit my mouth. The dip and the cabbage were perfect accompaniments to the dish. 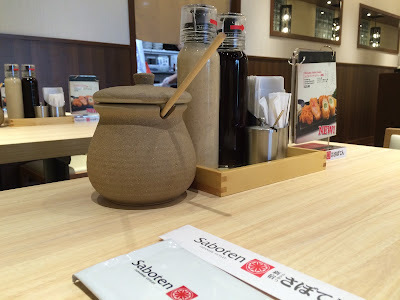 Overall the meal was a very pleasant experience indeed and another reminder of the many different ways in which Japanese cuisine can continue to delight and surprise my taste-buds.